Army Public School, Mathura hosted the SWC Inter APS Debate Competition – 2018 in which 17 schools of various APS of SWC participated. The debate was organised in Hindi and English on 28th & 29th Aug respectively . The topics for the debate were the burning issues of today as the usefulness of social networking sites in child development and the relevance of present education policy in social development. Over 100 students showcased their oratory skills in this two days competition. 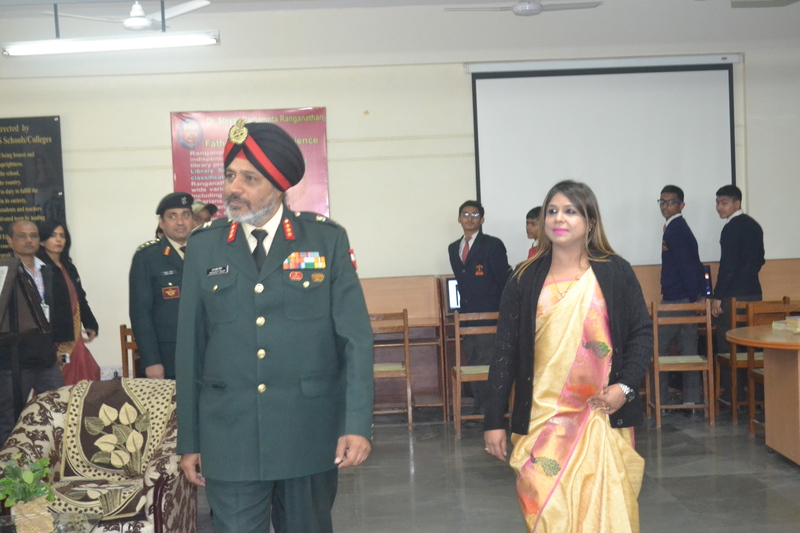 The Chief Guest for the program was Brig S.Ramanathan (Chairman APS Mathura) . He gave away the prizes to the winner teams- APS-Ranchi in Hindi and APS-Mathura in English . The best speakers & interjectors in both the competitions were also given away the prizes. The program was a great success and appreciated by one and all present. The Annual Adm and Technical Inspection of APS Mathura for the year 2018-19 was carried out by Brig. IM Lamba, DY GOC, HQ 42 Arty Div; Col. HS SODHI (Retd),Addl Dir (AWES);Lt Col. Satyavir Singh, Edn Offr, HQ99 Arty Bde and Mrs. Sudha Madan, Principal APS,Alwar on 20th and 21st August, 2018. The team was formally welcomed by the Principal. The team witnessed the morning assembly which commenced with school prayer followed by the pledge, thought, quiz, speech and motivational song. Thereafter the team visited the school campus including all labs and library. The inspecting team appreciated the endeavor of the school administration for shaping the school so beautifully. Thereafter the Principal elaborated upon the campus and its achievements through a presentation. The Inspection came to an end with the interaction of the staff with the Presiding Officer and the inspecting team. It’s not enough to have power it’s important to know how to best harness it for our collective good . APS Mathura students mirrored this idea as they participated enthusiastically in the inter house Tug of War Competition .The competition was held on 18th August,2018 and the students from classes 9th to 12th exhibited their talent in the game . The competition was for both girls and boys of each house. This competition was particularly exciting as it saw the complete representation of each house in terms of its strength. The competition was organized under the supervision of physical instructors. Among the boys RANI LAXMI BAI HOUSE bagged the first position whereas HOSHIYAR HOUSE won among the girls. Fancy dress competition is a very popular activity at school and one of the most exciting event that children look forward to. The purpose of conducting the competition was not to blend learning with fun but also develop confidence in the students by giving them an opportunity to get on the stage and speak in front of an audience. Fancy dress competition for the students of classes IV and V was conducted on 18th Aug. 2018. The children had disguised themselves as Disney characters. Children dressed up in their colorful costumes and spoke a few sentences on the character that they depicted. Total 12 students i.e. 3 from each house had participated in the competition. The children had put in great efforts to make it interesting. Their effort and hard work was highly commendable. The competition proved to be great learning experience for the students and gave them a platform to explore their hidden talents. It was a red letter day in the history of India when the country got her freedom on 15 Aug ,1947. It took hundreds of years for us to break shackles of slavery . People of the country celebrate this national event every year .Each and every member of APS Mathura also celebrated its 72nd independence day with patriotic fervour . The celebration was commenced with flag hoisting followed by patriotic song , elocution and a beautiful dancing visual presented by the children . This occasion was graced by the Chairman of the school , Brig. S.Ramanatham. He blessed the students with his motivational words . Also on this special occasion, a few teachers of our school were awarded for demonstrating excellence in their respective areas. Although all teachers of our school have been very committed and dedicated towards the cause of education but a few of them moved an extra mile for the all round development of the school.22 teachers from various departments of our school have been awarded for the outstanding teacher award . It was a memorable day for all of us. The principal also facilitated the students with her valuable words and reminded them the sacrifices made by our great freedom fighters.Then Deborah Faith Samuel of class XI-A proposed the vote of thanks and the program ended with tree plantation and the sweet distribution to the children. It was on 4th August,2018 that deserving young talents of our school were bestowed with the responsibility of leading their school with confidence and competence. The investiture Ceremony set the student council ablaze for the academic session 2018-19. The school cabinet was formed through votes cast by the students and teachers. The event was presided over by the Principal wherein she honored RIYA DUSAD and SAHIL RATHORE of XII SCIENCE with the badges of the HEAD GIRL and HEAD BOY respectively. Further the other elected leaders were conferred with the badges by their respective incharges. This year the student council has been extended so the class prefects have also been appointed. They were also pinned the badges by their respective class teachers. Thereafter the student council including all the class prefects took the pledge to hold the school motto of loyalty, truth and honour in high esteem.Further the Principal congratulated the newly elected student council and concluded with a word of advice that they ought to be impartial and honest in discharging their duties. Music is one element creating fellow-feeling. The Military Band performs musical duties for military functions, usually for the armed forces. It plays an important role in instilling a sense of pride and motivating soldiers to accomplish deeds of excellence. On 3rd August, 2018 APS Mathura was pleased to host the ‘sikhlai pipe band’ from Fatehgarh (U.P.) which enthralled the audience. The leader of the band was L. Lantah from Manipur. The students were captured to see the band display and drum call. The Principal’s invitation to invite the band to school enabled the students and teachers see the amalgamation of inspiring courage and valour with martial music. We salute these brave hearts…. JAI HIND!